Why Anytime Fitness, North Peoria? Anytime Fitness is the only fitness facility in Peoria that is open for its member’s 24hrs/7days a week, 365 days a year. It is the only gym equipped with a state of the art security system so members can feel safe no matter what time of day (or night) they workout. In addition, all of the cardio machines are equipped with tablets as well as flat screen TV’s . These state of the art cardio machines also allow members to track their workouts so they can stay on track with their fitness goals. And new to Peoria is the Fitness on Request training system that members can take a variety of classes, anytime they choose. They can choose from 100’s of classes of which they can pick type of class, level of class and length! The multi-purpose room can be reserved for individual use or for groups that would like to take a class together! Live classes are offered as well. 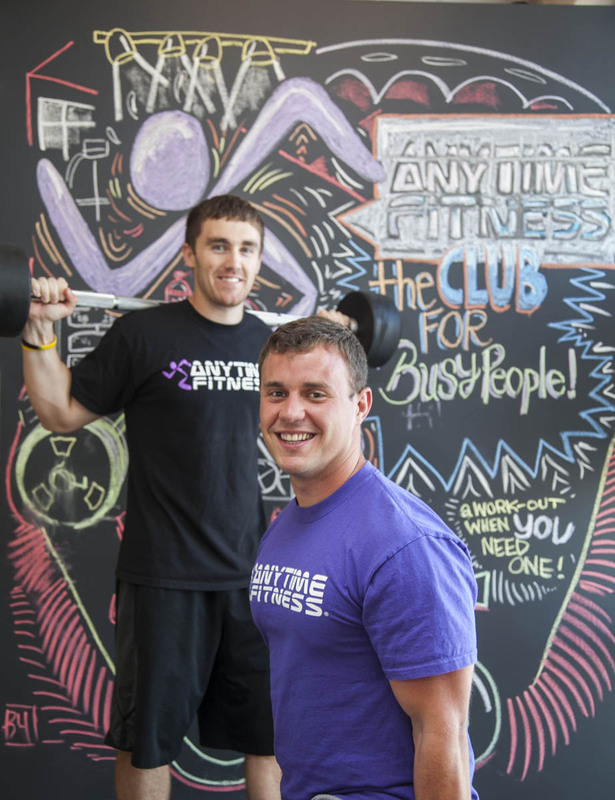 The innovative owner that brought Anytime Fitness to North Peoria, is Doug Pinter. Doug is the former Golf Pro of Arrowhead Country Club. He and his wife, Lindsay along with their two children Lola and Brady decided to take a chance at opening a fitness facility in Peoria. They took two years before opening their doors to make sure they did everything right! They joined every health club in town and utilized all of them to see what those gyms were doing correctly and not so well. After two years of figuring out “the secret to success” they opened their door to the public on April 26th, 2014 with a ribbon cutting with Chamber of Commerce. Joining Doug to open his doors was a talented group of fitness enthusiasts. Jeni Kuntzman- Manager, Jessica Alanis-Marketing Coordinator, Patrick Thompson-Head Trainer and coaches’ 2 Inspire-Alex Faulkner, John Boopha and Joe Waters. Anytime Fitness, North Peoria is staffed with the best Personal trainers in town and are eager to help members meet their individual fitness goals through dedication, nutrition, and cardio and weight training.